WHAT HAPPEND IN APRIL OF 1906? Here is how the calendar looked in 1906. We marked some of the dates we thought worthy of special note. That is where we’re headed, but in this chapter we want to go back still farther in time to get the settings where our story takes shape. How could we care about what happened so long ago? It is a part of our history, yes, but it is also a part of our present. Holiness Associations were formed in the late 1800s to promote the teaching of holiness among Christians. It was local at first and most of the people involved were Methodist. It was not a new church, but rather an attempt to promote the teaching of holiness among church people. Soon regional associations were formed. Not all interested people joined in association, some groups were independent, but their history and goals were all the same. Almost all of them were members of the Methodist Church in the beginning, but gradually new churches evolved from within these groups. Today, the Church of the Nazarene is one of the best-known churches to grow out of the holiness movement in the late 19th century. The rise of the holiness movement began because of a perceived change in the Methodist Church. From its beginning, the Methodist church had taught that Christian perfection through sanctification was of paramount importance to Christian living. John Wesley, founder of the church, wrote a book entitled A Plain Account of Christian Perfection. He placed great stress on the importance of sanctification. For nearly a hundred years his church continued this theme. The view of the church was inward; Christian perfection of the believers. Late in the eighteen hundreds however, the view of the church turned outward. Social issues became a part of the church agenda. Battling social ills took priority over the need for sanctification of the believer. What the issues were then is not well known, but they may not have been too different than in our time. During the Cold War, for instance, Communist infiltration of schools and government became a matter of church concern to many. Now, abortion, the rights of various groups, violence on TV, etc. are church concerns. During the twenties, temperance (abstention from alcoholic beverage consumption) was an important church/social issue. We are descended from Holiness people. Our view is inward. We don’t march in anti-abortion parades. We are anti-abortion, but it is our view that preventing an abortion by blocking the entrance to a clinic (without salvation of the mother) might end with both mother and child losing their souls. On the other hand, if we can effect the salvation of the mother, as an individual, she will have no abortion, and her soul will have been saved as well. We are single-issue people, but that one issue is personal salvation, (and sanctification), not social reform. There are reports of people receiving a spiritual blessing and speaking in tongues before 1900, but those people had been taught they already had been baptized with the Holy Ghost when they were sanctified. Therefore they missed the truth of what was happening. No teachings were corrected and no one took a doctrinal stand at the time. The most important event for us to remember from the early history occurred on 01/01/01, that is, January 1, 1901. In mid October of 1900, a preacher named Charles Parham started a Bible school in Topeka, Kansas. He called it Bethel Bible College. A few families and some individuals joined until there were 35 to 40 students. A few students attended so they could become better Christian workers or home missionaries. Others just wanted to become better Christians the same as you and I do when we go to a Bible study at our church. Parham was a small man and had had some health problems as a youngster. As a result of prayer, he had been miraculously healed. Now, as a minister, he taught that people should find salvation, sanctification, and divine healing, but they must “earnestly contend for the faith once delivered to the saints." This faith he called “Apostolic Faith." In his college (actually a Bible school conducted in an old castle-like house where classes only lasted for a few months) he banned all commentaries and Bible help books. The Bible would be the one and only text used. Students lived on campus and had ‘all things common’. They may have had a prayer wheel so that prayers and Bible study were continuous. Both Parham and his students were holiness people. In 1900 this term meant people who believed they were saved, sanctified, and had the indwelling of the Holy Ghost. They did not receive the experience of speaking in other tongues, but believed that at sanctification they received the Holy Spirit. In the time from mid-October until just before Christmas Day, they had covered the Bible subjects of Repentance, Justification, Consecration, Sanctification, and Healing. At Christmas time, the teacher, Parham, had to leave for some other engagement, so he told the students to continue their studies about the baptism of the Holy Ghost. Most Bible schools depend heavily on commentaries in their studies, but Bethel Bible College had no commentaries; only the Bible. During the time Parham was gone, about six of the ladies had gone into the prayer room to study and pray. As they read about how the Holy Ghost had been given on the Day of Pentecost, one of them said, “We did not speak in other tongues when we got sanctified." Someone had the courage to compare her own beliefs with the Bible. That was significant. Agnes Ozman, one of the six ladies present, prayed, “Lord, You know our former teaching, how that we were taught that we received the baptism of the Holy Ghost when we were converted. Then, afterwards, we were taught that we received the Holy Ghost when we were sanctified. Now, Lord, if we have not received the Holy Ghost, give it to us.” She asked the others present to pray for her. That is how that, just past midnight, on 01/01/01 she received the Pentecostal experience. It is important to our own history to remember that neither she nor her companions had any former training to explain what happened that night. What happens when you have only the Bible for a source of knowledge? Shouldn’t you come to a knowledge of the truth? It would seem so, but in this case there was no teacher and things could have gone wrong. That is exactly what Parham thought had happened when he returned on the third of January. By the time Parham returned, about a dozen of the students had received the same experience. He was surprised, and was wondering how he could put a stop to it all when the Lord asked him if he would stand for that doctrine. Having received such a message from God, he also sought for and received the same experience. A little more than two weeks later, The Kansas City Journal quoted Parham as saying, “An unbeliever, on going into church where persons are speaking with tongues, will say, they are mad, as unbelievers said of the apostles on the day of Pentecost. When I first went into the room where these students were talking in unknown tongues, I said, in the words of one of old, ‘Surely they are filled with new wine.’ And thus the unbeliever is likely to think.” (Much later, stories were circulated that Parham was present, and prayed for Agnes Ozman the night she was baptized with the Holy Ghost. Those stories came into being at a later time.) Not all the students accepted the newly discovered experience. Most of them opposed what was happening and left the group. At first, it seems most people opposed the new teaching that came out of Bethel Bible College. There seemed to be few converts. Parham’s answer to those who opposed his teaching was, “Why not accept the Bible evidence?” He had exhorted his students to have apostolic faith, so after receiving the Pentecostal experience they took that expression for their name. In 1903, some of the group, along with Parham, went to Galena, Kansas for three months special meetings. They began having good success. Many were saved, sanctified, and baptized with the Holy Ghost. Howard Goss (who later gained prominence) was one of the converts. About a hundred people received the baptism of the Holy Ghost during those meetings conducted by the Apostolic Faith. Late in 1904 or early in 1905, Parham and some of his Apostolic Faith workers went to Texas for meetings. They held meetings in several locations in Texas with good results. By this time, the Apostolic Faith had grown to a rather large group, but only in Kansas, Missouri, Arkansas, Oklahoma, Texas, and nearby areas. Growth was especially rapid in Texas. It is estimated that by late summer in 1906, the Apostolic Faith numbered 13,000 in the area of Texas through Kansas. W. F. Carothers, pastor of a holiness church in Brunner, Texas, along with his congregation, came into the Apostolic Faith. Carothers was a lawyer and real estate broker as well as pastor, but he was deeply devoted to Gospel work. Parham made Carothers his State (and later, Field) Director for the Apostolic Faith, while taking the title of “Projector” for himself. Together they opened a Bible school in Houston, Texas in the fall of 1905. William Seymour had been a Baptist preacher, but his search for a closer walk with God led him to the holiness people. There he was sanctified and became a minister in the holiness work. At the time, the south was racially segregated. White people and black people didn’t go to the same schools, churches, restaurants, hotels, etc. But William Seymour learned about the school and wanted to attend. There are so many versions that it is not possible to tell exactly how it happened -- perhaps his friend Lucy Farrow helped -- anyway Seymour was able to listen in on the school. He believed and embraced the teachings, although he did not personally receive the Pentecostal experience while there. A great awakening revival of religion began in the fall of 1903 and continued for about two years in Wales. It is estimated that 100,000 people were converted there during that time. There was no connection between the Welsh revival of 1904-1905 and the Pentecostal revival that had its origin in Topeka, Kansas on January 1, 1901. What happened was that news of the Welsh revival reached the west coast (Los Angeles) before news of the Apostolic Faith revival did. Someone wrote that the Azusa Street revival began in Wales. Unfortunately, most people who later wrote a history about the events that had occurred there copied the error. This belief persisted until it was almost universally accepted as true. Only very recently did interest in those early events turn up the truth. Those who were praying for a Welsh-type revival in their church supposed that the revival on Azusa Street in Los Angeles was, in fact, an answer to their prayers. It may well have been THE answer to their prayers, but they misunderstood how it came about. OOPS, got ahead of my story. Pastor Smale, a native of Wales, was the pastor of a Baptist church in Los Angeles. He returned home very much excited and enthused about the Welsh revival after a visit there to his old homeland. Why couldn’t Los Angeles (his church specifically) have such a revival? It happened, there was a revival under his ministry in that church, but it was local; it did not sweep Los Angeles. However, it was of such duration and intensity that he was forced to resign from the Baptist organization. He then formed an independent church named “The New Testament Church." An occasional visitor to the New Testament church was Frank Bartleman. He was an unusual person. He was a preacher but would not accept a pastorate. He also would not affiliate with any denomination. But he did go around among all the churches where he was allowed to participate to any degree. For instance, he would go to the New Testament church before time for the church service to begin and urge all those who had come early that they should not depend on the pastor to start the prayer meeting. He would try to get them to begin a prayer meeting on the church steps before the pastor arrived. One thing that Bartleman did, and did well, was writing. He wrote articles for several church papers. His articles about the revival at the New Testament church were widely read and created a certain amount of excitement. He also wrote letters to Evan Roberts, nominal leader of the Welsh revival, asking him to pray for a Welsh-type revival in the U.S. Roberts replied saying, “We will pray for you, keep praying.” This was repeated three or four times. These events came together in a pattern just prior to 1906. Just like sewing patches together to make a quilt, or fitting pieces of a jigsaw puzzle together, they wove a pattern in our own history. Now let’s look at 1906. January 1 was the fifth anniversary of the Apostolic Faith. Besides that, we have nothing for sure with a January date on it. Bible school ended in Houston, Texas and, as far as we know, Parham returned to Baxter Springs, Kansas where he had established his headquarters. Some would say it was at a later date that he left Texas. Carothers was in charge of the Apostolic Faith work in Texas. The Welsh revival was winding down about this time. The Apostolic Faith was isolated from other churches. If anyone wanted to say something about them, it wasn’t good. On the other hand, Bartleman’s articles about the great expectations of the revival at the New Testament Church were widely read in holiness church circles. With stories of the Welsh revival also fresh in their minds, prayer meetings became the watchword of the day. They sprang up in many different places. Some businesses even closed for certain hours of the day to accommodate noon prayer meetings. Mrs. Julia Hutchins was the leader of a few black families in Los Angeles who had embraced the holiness doctrine and were trying to start their own church. She felt called of God to become a missionary to Africa. Someone suggested to her that William Seymour of Houston, Texas would make a good pastor for her church. Perhaps it was Neely Terry who made that recommendation. In any event, he was contacted and invited to come to Los Angeles to preach in Mrs. Hutchins’ church. This contact was made either in January or early February of 1906. What we don’t know is whether anyone in Los Angeles knew about Seymour’s newly formed association with the Apostolic Faith. If they did know about it, it is not probable that they knew what that meant. News of that kind had not traveled out west as yet. Seymour was not the only, nor even the first, black person in Houston to accept the Apostolic Faith doctrines. Lucy Farrow, his friend, had not only believed, but had already received the Pentecostal experience. J.A. Warren was another, and perhaps there were many more. We know about these three because they all arrived in Los Angeles before April 9, but I’m getting ahead of my story again. February 22 (about) brought Seymour to Los Angeles. It was probably around the 22nd of the month, and he came alone. The people in Los Angeles sent him his fare. He went to Mrs. Hutchins’ church and, guess what. He preached about being baptized with the Holy Ghost and speaking in other tongues as the initial evidence. He said one should already be sanctified before receiving the baptism of the Holy Ghost. Mrs. Hutchins was shocked! It didn’t sound right to her. She had never heard of such a thing. She called in the local leaders of the holiness movement and asked them for a clarification and for advice of what to do about the new preacher (whom she had understood was a holiness preacher). She locked him out of her church! Not everyone who had heard Seymour preach was against him. He had a place to stay at the Edward Lee home and he could have prayer meetings there if he wished. Richard and Ruth Asbery, who lived at 214 Bonnie Brae Street, also invited him to hold prayer meetings in their home. Not far from the Asbery home was an old, abandoned, African Methodist Episcopal (AME) church that had been converted in part into a tenement house, leaving a large, unplastered, barn-like room on the ground floor. It was here that a dozen or so people would gather at about three in the afternoon, going on to the Asbery’s home at about seven for the evening prayer meeting. It seems that the earlier gathering (at the old abandoned church) attracted some people who did not attend the evening meeting at the Asbery home. We think that prayer meetings began first at the Lee’s, moved to the Asbery’s and the afternoon gatherings in the old church were added last, but that is not for sure. Seymour may have taught at the afternoon gathering. In any event, those who came to the old church knew of Seymour’s teaching. One of the visitors was Glenn Cook who worked for the Los Angeles Times, but he was also a holiness lay preacher. Some of the people from the New Testament Church may also have gone there. Our March calendar begins and ends in much the same way; Seymour still living at the Lee’s home and holding cottage meetings at the home of the Asberys. People were meeting at the abandoned church in the afternoons and coming to prayer meetings in the evening. At the end of March or first of April, Seymour called for a ten-day tarrying meeting. Perhaps that is why people began meeting in the old church in the afternoon. Tarrying meetings could hardly be held in the Asbery home during the day. Thus begins April of 1906. Two more people arrive from Houston, Texas; Lucy Farrow and J.A. Warren. Not much is known of Warren, but Lucy Farrow had already received the Pentecostal experience some time before leaving Houston. She encouraged and prayed for those who were seeking the experience in Los Angeles. April 9 On Monday, some of the ladies at the evening meeting in the Asbery home received the baptism of the Holy Ghost with the same evidence as on the Day of Pentecost, just as Lucy Farrow had and just as Seymour had seen in Houston, Texas at the Apostolic Faith. April 12 Thursday, Seymour received the Baptism. It is interesting that neither Parham nor Seymour were the first of their congregation to receive this experience. There is a difference in that Seymour had been taught about it beforehand and Parham learned from his students afterwards. April 14 Saturday they moved the evening meetings from 214 Bonnie Brae to the old, abandoned Methodist church at 312 Azusa Street where the afternoon meetings had been held. April 15 Easter Sunday at 312 Azusa Street; the new church home. April 18 The city of San Francisco, nearly 400 miles to the north, is virtually destroyed by an earthquake and the fire that raged for days afterwards being fed by broken gas mains. June 3 Pentecost Sunday. This was the anniversary of the Day of Pentecost. In Seymour’s words, "It was the divine call that brought me from Houston, Texas to Los Angeles. The Lord put it in the heart of one of the saints in Los Angeles to write to me that she felt the Lord would have me come over here and do a work, and I came, for I felt it was the leading of the Lord. The Lord sent the means, and I came to take charge of a mission on Santa Fe Street, and one night they locked the door against me, and afterwards got Bro. Roberts, the president of the (Southern California) Holiness Association, to come down and settle the doctrine of the baptism with the Holy Ghost, that it was simply sanctification. He came down and a good many holiness preachers with him, and they stated that sanctification was the baptism with the Holy Ghost. But yet they did not have the evidence of the second chapter of Acts, for when the disciples were all filled with the Holy Ghost they spoke in tongues as the Spirit gave utterance. After the president heard me speak of what the true baptism of the Holy Ghost was, he said he wanted it too, and told me when I had received it to let him know. So I received it and let him know. The beginning of the Pentecost started in a cottage prayer meeting at 214 Bonnie Brae." What really happened on Monday evening, April 9, 1906? C. M. Robeck, Jr.’s account states that Seymour laid his hands on Edward Lee and that Lee received the baptism in his home on Monday before Seymour left for the evening meeting at the Asbery’s home; and that when Seymour reached the meeting with that news, Jenny Moore and several others broke into tongues. An article published in the April 8, 1956 edition of The Pentecostal Evangel quotes one saying that, at Edward Lee’s request, Sister Farrar (Farrow) laid her hands on him as they sat at dinner in the Lee’s home. Lee received the baptism and then went to the meeting at the Asbery’s home. When Lee entered, he raised his hands and began to speak in tongues. Six people, who were already on their knees praying, began to speak in tongues. Vinson Synan states in his book that Seymour had been living at the Asbery home since arriving in Los Angeles and that he preached in their living room. There on the night of April 9, 1906, Seymour and seven others fell to the floor in a religious ecstasy, speaking with other tongues. In Seymour’s words, published in The Apostolic Faith paper, "The beginning of the Pentecost started in a cottage prayer meeting at 214 Bonnie Brae." The paper also states, "This work began among the colored people. God baptized several sanctified washwomen with the Holy Ghost, who have been much used of Him. The first white woman to receive the Pentecost and gift of tongues in Los Angeles was Mrs. Evans." No mention whatever is made of Edward Lee in the account in The Apostolic Faith paper. That is as close as we can come to that Monday evening; if and how Edward Lee was involved is not known for sure. Most of the people at the cottage prayer meetings were formerly from Mrs. Hutchins’ church on Santa Fe Street, but others knew about it, and when people began to receive the experience they had been told about, word spread rapidly. Crowds came. They flocked to the Azusa Street church. There was a great deal of opposition to his teachings, both in the Los Angeles Times and from holiness churches. One exception was those in the New Testament Church congregation. Many of them deserted Pastor Smale and moved to the Azusa Street church. For a time the congregation became mostly white, with a black minority. In late summer someone estimated the congregation at 25 blacks and ten times that many whites. If race was unimportant, why bring it up? Well, when we study the years following 1906, race becomes important, so this is for reference only. Although the Azusa church building was only 40 by 60 feet, it was never enlarged. For many, it was a revolving door experience. Individuals came from near and far to attend the meetings and see for themselves if what they had heard was true. Some would argue against it. Others would accept what they heard, seek for the experience and go back home to try to incorporate their new found faith into their old church. Most such efforts were unsuccessful. So many individuals from the Christian and Missionary Alliance Church were involved in this kind of effort that the question came up at their annual conference. Some prominent people within the CMA had received the Pentecostal experience, but the vote failed. As an organization they rejected the teaching. “Bro. W. H. Durham of 943 North Ave., Chicago, Ill. and Bro. H. L. Blake of Ruthton, Minn. who are both preachers of the Gospel, came to Los Angeles to see and investigate what God was doing. They were both baptized with the Holy Ghost and went back filled and saturated with the power of God speaking in tongues and magnifying God. ... They are members of the World’s Faith Missionary Association”. This was reported in the February-March 1907 issue of the Apostolic Faith paper from Azusa Street Mission. Durham and Mason were chosen for examples of independent preachers, not only because they were typical in many respects, but also because, if you choose to study the history of the whole Pentecostal movement, you will find they each had a major impact in the next few years. Some phrases from Durham’s testimony (given three weeks after he received the experience) are quoted because his background and experiences were later questioned. Mason wrote that “... I had a false interpretation in my heart concerning the speaking in tongues. I did not take it (as) literally as I did “They shall lay hands on the sick and they shall recover” ...God had given me the knowledge of healing...and many cases of diseases had been delivered. I interpreted the speaking in tongues to mean that we left off blasphemy, etc. But when I got to the place where, hungering and thirsting for God, I consented to His Word, I saw that we did not need that interpretation, that the only reason we were not enjoying the speaking in tongues was because we did not accept it. ... when I came, it was not strange to me for the Lord had showed it to me in a vision...” He sang and preached in tongues after surrendering ‘perfectly’ to the Lord. Quotations are from a letter written by Mason from 609 Stephens Ave., Memphis, Tenn.
At least one group came and went through Azusa. It was from the New Testament Church congregation. They moved into Azusa and then, quite some time later, moved out to a mission at 327 1/2 South Spring Street with Elmer Fisher as pastor. Also, quite a few missionaries came for the Pentecostal fire and returned to their fields, but we’ll just mention two missionaries who went from the “regular” Azusa church congregation. Lucy Farrow went to Liberia, Africa for seven months. Another was Julia Hutchins. That’s right! She was the one who stood up to Seymour when she thought his preaching was not correct. But for her, seeing was believing. She had been a leader and a person to stand for right as she knew it. Now she was a part of Seymour’s congregation. Imagine the feeling when she heard God calling her to become a missionary. (This call first came before Seymour came to Los Angeles) The call was so definite that she heard the date she was to leave. Three problems faced her; no money for fare, no one to go with her, and her husband was backslidden. It seems she trusted God for fare but was greatly concerned about going alone. But God had His plans all along. Before the departure date, her husband was “reclaimed” and also a niece, whom she had raised as a foster daughter, prayed through to all three of her experiences and wanted to go also. All three of them left on the date she had heard in prayer, and all their financial needs were met. God had not only provided for her physically, He had also sent (to her dismay) someone to tell her about her spiritual needs and how to receive power for service before going. Many came and went, but who were the regulars? My list would be the three from Houston and a dozen or so from the Santa Fe Street mission. Prominent among these would be Seymour, the pastor, of course. The list would also include Lucy Farrow, Jennie Moore and Sis. Prince. Jennie Moore was one of those baptized on April 9. About two years later she became Mrs. W. J. Seymour and, upon the death of her husband in 1922, she became pastor. Among the first white people to come were G.W. Evans and his wife May, Glenn Cook, Florence Crawford, and Hiram Smith, and the list goes on and on. Sis. Florence Crawford had been a very active Christian as a Methodist. One of her interests was prison work. She not only visited those in jail, she opened a harness repair shop so that she could hire those being released from prison in order to rehabilitate them. She was an entrepreneur, but her interests were limited to Gospel related work. Clara Lum knew shorthand, and in those days before electronic recording was invented, about the only way to make a record of what was being said was to take it down in shorthand. Remembering that Glenn Cook was a newspaperman, that Clara Lum knew shorthand, and that Florence Crawford was an entrepreneur, what would happen when they got together? A church newspaper, of course! Their first rule was that no editorial credits would be given. That makes it difficult for us to go back and give editorial credits, just as they hoped it would. Additional people on the staff are unknown, but there were others who helped. Seymour was the unquestioned leader as well as pastor, but it appears he was not directly involved in the project other than his sermons and admonitions were used in the paper along with testimonies and news about the spread of the revival. Without knowing, we would guess Glenn Cook wrote the editorials, Clara Lum collected sermons and testimonies in the meetings, and Florence Crawford was copy editor and publisher. How is that for not really knowing? Well, a lot of people disagree. They say that Seymour was the editor, but nothing seems to support that opinion. May and June are months of early growth, of coming together, of getting started. Some have charged a lot of fanaticism was present, but those people were looking for something bad to say. There was no order to the meetings, but there was order in the meetings. Let me explain; there was no designated time for songs, but there were songs; there was no designated time for testimonies, but there were testimonies. There was no designated preacher, but there was preaching. There were no musical instruments, but there was music. A typical meeting would begin with people gathering at about ten o’clock in the morning. Soon someone would get up and testify or admonish the group, or someone might start to sing and everyone would join in. “The Comforter has come” was a favorite song; it might be sung two or three times in one meeting. Sometimes Clara Lum or other office staff members read letters received by the office. Sometimes several would stand up and wait for a turn to give their testimony, but at the first, there were sometimes long periods of silence. Seymour, Glenn Cook, Florence Crawford, Bro. and Sis. Evans, Elmer Fisher, Hiram Smith, and others were preachers. Whoever felt led to do so would get up and preach when the time seemed appropriate. This sort of letting the Spirit lead did not appeal to everyone, but that was how it was done. Missionary effort was a main theme of those early times. The Holy Spirit was given to evangelize the world and that seemed to be on everyone’s mind. Where do we come into the picture? How did that part of the story begin? Let’s start with M.L. Ryan. Who was M.L. Ryan? He stepped out of history briefly, had his effect on us, and then stepped back into history again. He was a handsome young man with a closely trimmed black beard; a man who had great influence upon others. He, perhaps more than anyone else, shaped our personal history, yet we know very little of him. He was a minister and he published a holiness paper in Salem, Oregon. He wrote to the Azusa church telling how that he read the wonderful works of God (in a letter from Los Angeles) to those outside his office and a crowd gathered around. Some shouted and some wept. Pastor Ernie Hanson of Dallas, Oregon, had a church full of evangelistic young people. It was through M.L. Ryan that he came to know about the meetings at Azusa Street. Hanson attended some of the services held in Salem by Ryan. Pastor John Glassco, a black holiness pastor whose church was in an old converted blacksmith shop on SW 2nd and Main street in downtown Portland, Oregon, also learned about the Azusa revival from Ryan and his paper, Light. August 10 William Manley, editor of the Household of God in Oakland, came to Azusa just as many others had done, but before he returned to Oakland, he asked for Apostolic Faith workers to go and hold meetings in his church there. The workers were G. W. and May Evan, and Florence Crawford. This was about August 10. Florence Crawford and the Evans preached and laid hands on people to receive the Holy Ghost. During the five weeks they labored at Manley’s church, nineteen were saved, thirty sanctified, and sixty-five baptized with the Holy Ghost. A name is painted on the Azusa Street church. It was “Apostolic Faith Gospel Mission.” This greatly offended Frank Bartleman. He said they had failed God, and he left. Although he considered himself rather important there, (often saying “at Azusa we did this” or “we did that”) he left without claiming to have received the baptism. He did claim to have the gift of music, but not of words. When the ‘Heavenly Choir’ would sing in tongues, he would join in making guttural sounds that he said were beautiful. They were all singing the same verse of the same song at the same time so he could only ‘sing’ along without words. August 12 Someone gave Frank Bartleman some money so he rented a vacant church on Eighth Street and Maple Avenue on August 8, and opened it for services on Sunday, August 12. It was because they had failed God at the Azusa Street Mission, he said. God wanted him to do a work that would “go deeper.” He opened the Pentecostal Assemblies Church with himself as pastor, and then two weeks later, on August 26, he invited Wm. Pendleton to join him as co-pastor. Not long afterward, he resigned his position as co-pastor. Being a pastor just wasn’t for him. He did, however, claim to receive the baptism on August 16 while a pastor there. Wm. Pendleton was a lay preacher in the Holiness Church. He and about thirty-five other members were “turned out” of a holiness church after being baptized with the Holy Ghost. August 26 Howard Goss of Galena Kansas is licensed as a minister in the Apostolic Faith Movement. The license was signed by Carothers as Field Director and Parham as Projector. There may have been as many as 300 other ministers besides Goss in Texas and neighboring states, but he is the one we will hear about later on as we go on with this history. September 1 Happy 34th birthday, Sis. Florence Crawford! How are things in Oakland? Parham comes to Los Angeles. He had been expected earlier and there was anticipation of great spiritual blessings, but that is not what happened. It has been suggested that negative stories not be included in this article. After considering it for a while, it became apparent that truth is not always positive. Negative things really do happen. The Bible tells of both good and bad. Read about Samson or David or Saul or Judas or Demas. I have discovered that you cannot tell the good correctly if you omit the bad. For instance, if we omit the story of King Saul, we are unable to tell a part of the story of David. How were we to know about Agnes Ozman and Topeka, Kansas if we no longer talked about Parham? For a time, this lack of ‘negative’ information caused us to believe incorrectly that the Welsh revival and the prayer meetings that followed those reports brought about the beginning of the Latter Rain Gospel in April of 1906. Seymour discovered that Parham was teaching annihilation of the wicked, so he shut him out of the Azusa Street Mission. He was not permitted to continue to preach in their meetings. We don’t know when the trouble began, but Parham is not the only person who did not hold fast to the faith and, unfortunately, there would be others. As far as we can tell, Seymour made no accusations against Parham other than refuse to let him continue to preach at the Azusa Street Mission. What a blow to Parham! He made many accusations against Seymour. From our point of view, there is no question about which side we are on or why. But it is a sad thing to see. All mention of any former association was dropped. All reference to the past only went back as far as Los Angeles. This was commendable for as long as the problems persisted, but any history should surely tell the whole story. For Parham, the story only gets worse. He made vicious attacks against Seymour and his followers. They were wild fanatics, he said, and when he tried to bring about order, they threw him out. But his story didn’t prove out. His own attitudes and actions were too obvious to ignore. Soon everyone knew the truth. It didn’t happen in one day, but he lost many of his followers in a short time. Probably more than half of his former followers switched allegiance to Seymour within six months. Now Parham began to try to prove that he was the father of the Pentecostal teaching and that everyone owed allegiance to him. In fact, he later claimed the original outpouring of the Holy Spirit was on January Third when he returned to Bethel College. Actually twelve of the students were already baptized when he returned. Histories written by those who used Parham’s later claims for a basis, will not agree with this account because Parham’s later claims disagree with Agnes Ozman, etc. He claimed that he led his followers to accept the views about the baptism of the Holy Ghost which he had already embraced and that he was there when Agnes Ozman received that experience. He was one of those who laid hands on her in prayer, he said. The teaching of annihilation of the wicked (also called Conditional Immortality) says that the second death does away with them entirely; they do not suffer eternal punishment. That offers some hope to the wicked, but a careful reading of Christ’s words in Mark 9:43-48 takes away that hope. Eternal Heaven and eternal Hell were taught at Azusa. During the nearly four months that Frank Bartleman attended meetings at the Azusa Street Mission, before he was offended and left, he wrote that a worldwide revival had begun and was sweeping Los Angeles. Readers in the East who also read the Nazarene periodical, which was also printed in Los Angeles, wrote letters of inquiry to the Nazarene Church asking for details. They had seen nothing in The Nazarene Messenger about this great, sweeping revival. Finally, Phineas Bresee, founder and head of the church, replied: "...We made no mention of the matter in the Messenger, not deeming it of sufficient importance to demand attention from outsiders. ...some parties who had the confidence of editors in the East sufficiently to secure the publication of what they have written, having given such marvelous statements of things as occurring in connection with this thing, that for the sake of those at a distance, and the many who are writing us about it, we deem it wise to say a simple word. Locally it is of small account, being insignificant both in number and in influence. ...It has had, and has now, upon the religious life of the city, about as much influence as a pebble thrown into the sea:.. Two principal things which are emphasized, and wherein they claim to differ from other, is, that Christians are sanctified before they receive the baptism with the Holy Ghost, this baptism being a gift of power upon the sanctified life, and that the essential and necessary evidence of the baptism is the gift of speaking with new tongues. ...the speaking with tongues has been a no-thing-a jargon, a senseless mumble, without meaning to those who do the mumbling, or to those who hear." The article by Bresee was much longer than shown above, but this is sufficient to show that points of view were widely different. Apart from the put-down, Bresee had an accurate idea of the doctrines. But he should have been there when foreigners testified that they had understood what was said in their own language. This included Chinese, Russian, Turkish, Spanish, Italian, etc. Frank Bartleman was so taken up with himself that he wholly misunderstood what was going on. He had a feeling that since he had written four letters to Evan Roberts and had urged people at the New Testament Church to begin prayer meetings on the front steps of the church while waiting for the pastor to arrive, that he had been a major cause in what happened on Azusa Street. In reality, what was happening in the Azusa Street Mission was a continuation of what had happened earlier in the home of Richard and Ruth Asbery on Bonnie Brae Street. And what happened there was related to something that had happened more than five years earlier. Something Frank Bartleman had nothing to do with. His book, How Pentecost came to Los Angeles, has an accurate timeline; he was there for almost four months, but his basic premise is in error. We do not think Pentecost came to Los Angeles as told in his book. The book has now been revised and reprinted under the name AZUSA STREET. While Parham was loosing influence, Seymour was becoming nationally recognized as the leader. It had been Parham’s Apostolic Faith Bands. Now it was Seymour, titular head on the Pentecostal movement nationwide. Carothers remained loyal to Parham for a few years and his own church in Kansas remained so, but elsewhere his influence was greatly diminished. The first two papers from the Azusa Street Mission alluded to the fact that Parham was leader of the Apostolic Faith. Issue three fell silent on the matter and issue four, in a subtitle to the lead editorial, says “Jesus, Our Projector and Great Shepherd”. The editorial goes on: “Many are asking how the work at Azusa Mission started and who was the founder. The Lord was the founder and He is the Projector of this movement. ... Bro. Seymour is simply a humble pastor of the flock over which the Holy Ghost has made him overseer, ...” Notice how there is no accusation, no finger pointing, no effort to woo others or take advantage of a situation. If you don’t know who the projector is, it doesn’t tell you; if you do know, it tells you that no human being holds that position in regard to the Azusa mission. In late 1906, G.B. Cashwell of Dunn, N.C. came to the Azusa Mission to seek “Pentecost”. He was a preacher in The Holiness Church. He said, “The first altar call I went forward in earnest for my Pentecost. I struggled from Sunday till Thursday. While seeking in an upstairs room at the mission, the Lord opened up the windows of Heaven and the light of God began to flow over me in such power as never before. I then went into the room where the service was held, and when Sister Lum was reading of how the Holy Ghost was falling in other places, before I knew it, I began to speak in tongues and praise God.” After returning to Dunn, Cashwell began to preach about being baptized with the Holy Ghost; crowds came. At first, there was a division within the church; some opposing and some agreeing. Ultimately, the church leader resigned and the name of the church was changed to The Pentecostal Holiness Church. Cashwell traveled through the Southeast and succeeded not only in gaining many converts in his own church, but also spreading the Pentecostal teaching to other churches. A.J. Tomlinson, head of the Church of God, headquarters, Cleveland, Tenn. had, apparently, already accepted the doctrine, but received the experience after inviting Cashwell to preach at his church. There was no affiliation between the Pentecostal Holiness Church, the Church of God, (Cleveland, Tenn.) or the Apostolic Faith. There is a similarity of doctrine. Services in Oakland were held at the “Household of God”. However, while Sis. Florence Crawford was there, she held cottage meetings in San Francisco. Perhaps someone had written to the publishing office at Azusa Street Mission asking for services to be held there or perhaps it was some of her family member who resided there. As far as we know, this was her first “new ground”. It appears that from Oakland, Bro. and Sis. Evans went to Woodland, CA., Bro. and Sis. Junk and Sis. Lulu Miller went to Seattle and Sis. Florence Crawford went to Salem Accompanied by Sis. Ophellia Wiley. December 15 (about) Sis. Florence Crawford arrives in Salem. (Note: At this time there are no plans to go to Portland as far as we know.) The arrival of Sis. Florence Crawford had been publicized in Light and also by word of mouth from the meetings in Salem. Some of those who went to hear her were Pastor Glassco’s wife and children (he stayed in Portland), Alonzo Ott (grandfather of Jim Ott), Pastor Ernie Hanson of Dallas, OR, and Bro. Peters of Albany, OR. News item, December 20: “A cancer and a rupture of seven years standing have been healed in Salem since we got here. ...” FLC. If you are looking for the descendants from some of those earliest people who were here about this time, start with Jim Ott and Jane Ewers. Their grandfather, Alonzo Ott, went to Salem to hear the evangelist from the Azusa Street Mission (Florence Crawford) who was to preach in Ryan’s church. Later, back in Portland, the Otts heard news about some meetings going on down on 2nd and Main Street. This was a mixed report. Some said it was terrible; others said it was the same people who had been in Salem. Alonzo wasn’t sure. It didn’t sound good. His wife, Elsie, wanted to go and see. He had told her how wonderful the meetings were in Salem, and now, maybe these were the same people. Alonzo still wasn’t sure. What they said about those meetings downtown was so terrible; how could it be the same people? He told Elsie to stay home; he would go and see. If it was the same people, then she could go also. Sure enough, it was the same old story; good news, bad publicity! Elsie’s first meeting was on January 6, 1907, on 2nd and Main Street. She wrote, “In 1905 we were in a holiness camp meeting and subscribed for a holiness paper. In 1906 when the power fell in Los Angeles, California, the editor of this paper began to tell about it in his paper, and we became very much interested. ... we saw a notice of the meetings that were to be held in Salem, and didn’t know whether we would ever have a better chance or not to find out about this work. So we decided for my husband to go down Saturday evening and spend Sunday in Salem. He was sanctified at Salem, and came home so happy.” Another one who was at the meetings at Salem was Bro. Bourcey. He became one of the ‘old-time warriors’ of the Gospel. Frances Thornton and her twin daughters, Beatrice and Margaret (Beatrice is Gerry Hansen’s mother) came into the church early in 1907 while Sis. Florence Crawford was in Los Angeles and Bro. M.L. Ryan was holding the services in Portland. David Lesher’s father also came into the Apostolic Faith Church in Oakland, in 1907. While Pastor Glassco’s wife was in Salem, she invited Sis. Florence Crawford to come to Portland and hold meetings in their church on 2nd and Main Street. We don’t know much about the congregation there; Elsie Ott tells that the congregation had been dwindling and the pastor had been praying for something to happen to make a change. This could have been an answer to his prayers. Sure enough, the invitation was accepted; both M.L. Ryan and Florence Crawford came to Portland. Humble beginnings never hinder the Spirit of God. Perhaps the opposite is true. December 29 Sis. Florence Crawford arrived in Portland at noon and went to a meeting in Glassco’s church at 215 SW 2nd Ave. at 3:00 PM that afternoon. She will stay for two weeks, then leave for home in January. “Peace from God the Father be unto you and all the saints. “Well, God has stirred this North till every devil in Hell is stirred also. I finished my work in Salem; was there two weeks. Seven received Pentecost. The saints are in prefect harmony. Students, city officials and the first people of the place heard the Gospel, but as far as we can see now, they have rejected the Gospel. Most of the ones who received their Pentecost are from the little places around, and they have gone home to spread the glad tidings of this precious Gospel. Oh my heart is so full this morning. Glory. Glory. Glory. “ January 8, The crowds throng the hall. We have to have a policeman to keep the aisles clear. They tell us throngs of people come and are turned away. The Zion people held a mass meeting Sunday and decided to come in a body for their Pentecost. Oh I am so glad He has chosen me. The Lord has healed some bad cases. One woman had epileptic fits. When the devil went out of her, she was so weak she could not stand. A man’s hand that was helpless was healed. A woman with her mind almost gone was healed in the hall last night before the sinners’ eyes. “Pentecost falls on people when they come the second time to the meeting, sitting in their seats. “I stay in the mission. It’s humble quarters, but Jesus is here. Every minute of my time is given to God. I get tired sometimes. Was sent to pray for a man with a high fever. I prayed before I went, was so tired. Jesus said, “I do the healing.” When I got there, Jesus healed him before I laid hands on him. He got up and came to meeting. Oh, I am learning the wondrous secret; it is letting Jesus do the work and carry all the load. Oh, I am so happy in His love and service. “People from all over are coming. A young lady came from Albany. She was a sinner, and got all, even her Pentecost, yesterday, all in one day. There are thirty-eight now that have received the baptism, eight since Saturday, and this is Tuesday morning. “Love to all the saints. Jan. 6 Elsie Ott receives her baptism in the second meeting she attends. Bro. Bourcey and Sis. Crawford were praying for her as she worked her way forward; first standing, then sitting on the lap of a lady who was fortunate enough to have a chair, and finally lunging at a spot someone vacated at the altar. Jan 12 (about) Sis. Crawford leaves for home via Oakland and Santa Rosa. Yes, Sister Florence Louise Crawford did arrive in Portland at the end of December in 1906, but for her it was not over and done. She had been gone from home part of November, all of December, and most of January, making stops along the way home from Portland. While she was gone, Glenn Cook also began a three month evangelistic trip. December 4, he left for Oklahoma and then on to Indianapolis, his home town, via Chicago. Guess what happens when the main publishing staff are also office staff and also evangelists? Right! Check this editorial. Catch up in the office and what happens? It’s back on the road. “At the close of the last service I was in there, after the Lord had sent a wonderful message through Bro. Ryan, the seekers fell like dead men, sinners were saved, believers sanctified and baptized, and Oh how God did heal the sick.... — “Florence Crawford.” Home address, 149 E Ave. 53, Los Angeles. See the new address? How many other people had their home address printed in the paper? The new home address listed above was a clear statement that Sister Crawford was one of those who chose to walk in the light when it came. Unfortunately a few people chose to try to turn this around to say something negative about someone who was determined to follow the truth when it came, regardless of the personal sacrifices involved for them to do so. We commend Sister Crawford for stepping out of an adulteress marriage when she received the light on it. Mar 21 News item from Spokane, WA., Bro. M.L. Ryan writes that ...The Apostolic Light will be somewhat delayed, owing to my removal from Portland office to the work to which God has called me in Spokane —M.L. Ryan. Good-bye Bro. Ryan. Thanks for bringing Sis. Florence Crawford to Salem and holding things down for a while in Portland. Bye. April 4 Sister Crawford is in Oakland and on her way to Portland. “The work in San Francisco is just grand”, she reports. May 3 Henry Prentiss, Sister Rees, and Sister Crawford arrive in Portland. June-August A camp meeting is held in Portland. Pastor Glassco went to the owners of the property at 12th and Division Street to make arrangements to hold a camp meeting as he had done in years before. His ‘tongues of fire’ might set the woods on fire, they said, but finally consented to let him use the location. It was no secret that Sister Crawford had been preaching about the baptism of the Holy Ghost and fire at Glassco’s church in downtown Portland! From Dallas, Or., Pastor Hanson and his congregation also joined in and set up a ‘Dallas Section’ on the campgrounds and later had their own camp meeting. Ora Janes was one of those from Dallas. Bro. J. G. (Jack) Robbins heard of the camp meeting and came for his baptism. He became one of the most loved and admired of those early ‘old timers’. Before camp meeting was over, Sis. Crawford was called back home to Los Angeles, but things didn’t always run smoothly without her. The story behind the story is that Chas. Parham eschewed organization. He presided over ‘Apostolic Faith Bands’ in the early days. Seymour followed that pattern of not establishing order. (Later it caused him trouble too.) At first, Sister Crawford followed the same pattern. Anyone who said they were called to preach and who held the ‘full gospel’ teaching was permitted to sit on the platform. There was no prior selection of who would preach during a service. The one who felt led to do so did so. This kind of openness has been misinterpreted as undenominationalism. It can lead to confusion. It did in Portland. A man got up to preach and a woman got up and closed his Bible. That is when the call went out to Sister Crawford and she returned to Portland before too long. Sister Crawford maintained a home in Los Angeles, but her mind was on Portland, San Francisco, and Minneapolis. Congregations in all three cities looked to her for leadership and help. The trip that started in March brought her to Portland May 3 and she stayed for most of the camp meeting as noted before. From there it becomes increasingly hard to track her. The decision to move from Los Angeles to Portland came to Sis. Crawford in St. Paul, MN. We are not sure exactly when that occurred, but it was in early January 1908. At some point, we don’t know when, Glassco offered to turn his church over to Sis. Crawford. It would be her church. It would be The Apostolic Faith, Portland, Oregon. Dec. 7 Happy Sixteenth birthday, Raymond R. Crawford. What happened 1908 to 1915 ? Sis. Crawford moved to Portland bringing Sis. Lum and the Apostolic Faith paper with her. The hall at First and Madison was abandoned at the start of camp meeting, 1908, just as the one at Second and Main had been a year earlier. After a three-month camp meeting in the Mt. Tabor area, church was opened at a new location, Front and Burnside. That would be the Portland Headquarters for the next fourteen years. No more looking for a new hall after each camp meeting. Bro. Ray was saved October 18, and was ordained as a minister about two years later. The Apostolic Faith Paper was still being published, but now in Portland. A notice in the May 1908 issue of the Apostolic Faith paper published in Los Angeles said: “For the next issue of this paper address THE APOSTOLIC FAITH CAMPMEETING, PORTLAND, ORE.” Incidentally, this move of the paper from Los Angeles to Portland caused a lot of criticism of Sis. Crawford. She stole the paper; she destroyed Seymour’s influence by stealing his mailing list, and other similar charges were made against her. Quite obviously, if Seymour was the publisher, then he was responsible for that note in the May issue of the paper (still in Los Angeles) stating that the next issue would be from Portland. If she stole it from him, then he was her accomplice. Preposterous! The first Portland issue in July 1908 carried the notation “We have moved the paper which the Lord laid on us to begin at Los Angeles to Portland, OR. which will now be its headquarters.” Interestingly, that first paper was published from the Mt. Tabor camp meeting, a temporary location. It was not until October that the Front and Burnside location was used by the church. Then, on 11 October 1909, the church was incorporated in the State of Oregon at Portland. Signers on the incorporation document were 1) Jennie E. Seymour, 2) Malinda Mitchell, and 3) Edward W. Doak as trustees. Back in Texas and the neighboring states, many of the former Apostolic Faith congregations became independent groups. To them, the name Apostolic Faith meant Chas. Parham and it was therefore unacceptable. Howard Goss contacted Charles H. Mason and asked to be licensed in his church, the Church of God in Christ. We don’t know if he was the first, last, or in-between, but most of the other former Apostolic Faith preachers were also licensed by Mason. It seems that for a while, half of Mason’s congregations were whites. To these people, Seymour was only a temporary leader. He was still Apostolic Faith and that wasn’t going to work with his being out west and Parham still being Apostolic Faith in their area. It just came out wrong. Also, with the removal of the paper, Seymour lost a voice in the area. Racism was the problem, Seymour said, as he began to lose influence. Racism wasn’t the problem when people were leaving Parham in droves and looking to Seymour for leadership, but now he was falling into the same trap as Parham. Losing a part of his followers caused bitterness to spring up. He blamed whites for bringing in fanaticism, (sounds familiar, doesn’t it?) and specified that his successor be a person of color. Racism, or any other kind of bigotry, is against the spirit of the Gospel, but when people begin to accuse others, it is sometimes a reflection of themselves they see. Ultimately, Seymour said that speaking in other tongues was not necessarily the initial evidence of being baptized with the Holy Ghost. That is just the opposite of what he said upon arriving at Mrs. Hutchens’ church on Santa Fe Street in February 1906. Portland had become headquarters for Sister Crawford. There was no solution for her but to become independent of Seymour. This was formalized on 31 January 1922 when Supplementary Articles of incorporation were signed by 1) Florence L. Crawford 2) R. Robt. Crawford, and 3) Mary A. Soyster as trustees. But she had her share of troubles here also. Things didn’t always go well in Dallas, OR. It was about 1909 or 1910 when some questions came up and Sis. Crawford sent Sis. Soyster to Dallas to resolve them. She returned without success. Next, Sis. Crawford went to Dallas and asked if they wanted to align to the Portland standard. They took a vote and the vote was no, no they didn’t want to continue in fellowship with Portland. Of course the vote wasn’t 100%. The Holmans, the Janes, and several other families began holding cottage meetings. Thus began the Dallas Apostolic Faith Church. Some of the people in Dallas, unaware that Sis. Crawford had started cottage meetings in San Francisco in 1906, believed that Dallas was the first branch church. It is true that when she first went to San Francisco, she was living in Los Angeles, and that she was on the ministerial staff there, but there was never any question of the fact that the people in San Francisco looked to her as their leader from the start. William H. Durham published a paper from his North Ave. Mission in Chicago. As time went on, he began to explain how that Christ died once for our sins. He called it the “Finished Work of Calvary”. In time, this idea was expanded to say simply that we are saved and sanctified at the same time; all we have to do is claim it. We can begin to grow in sanctification when we are saved, but perhaps never fully reach it. Note: Since sanctification is, and always has been, under attack we should take time out to look at it briefly. God showed Moses a pattern when he was on the mount. There were three places where the blood of sacrifice was to be offered; the first was at the Brazen Altar, the second at the Golden Altar, and the third was before the Ark within the veil. Hebrews 9:7,8 explains that the Most Holy Place beyond the veil symbolizes the Holy Ghost. We know that no one was permitted to come before the Golden Altar without being sanctified and we know that sins were confessed before the Brazen Altar where the sacrifice was being slain. Trying to combine or omit these steps constitutes a violation of God’s plan. Durham had changed his theology by altering God’s plan. It seems he wanted to make things easier by hauling the Golden Altar out and setting it up on top of the Brazen Altar, then skipping the Holy Place. Durham’s doctrine is based upon subjective argument, not Bible. It is therefore invalid; but it is not a good subjective argument. God is Triune; Christ was in the grave three days; we are created body, soul, and spirit; blood was struck three times at the Passover (once each upon the two side posts and once upon the lintel). Should not our return to God be in three steps instead of only two? Well, subjective arguments don’t really count, this was just to show that his argument was not good even from the subjective point. Back to the Biblical point, Christ prayed His intercessory prayer for the sanctification of those whom the Father had given Him out of the world as recorded in the seventeenth chapter of John. They were not of the world, even as Christ was not of the world and He had kept them through “thy word”. Now He prayed that they might be sanctified that they may be one with the Father and with the Son. They weren’t sanctified when they were taken out of the world. Note that the purpose for sanctification is that we might be one with God and with each other; not for the benefits that result from this relationship. A basic misunderstanding of sanctification often results from this confusion. Howard Goss heard Durham preach in Melvern, AR. about 1910 and changed his teachings to be like him. So did a lot of other former followers of Parham who were now part of Mason’s Church of God in Christ. Durham returned to Los Angeles and tried to preach in Elmer Fisher’s upper room church at 327 1/2 Spring Street, but was not permitted to do so. He went next to the Azusa Street Mission and started preaching his doctrine. Seymour was away but when he heard of it, he rushed back home and stopped him. Frank Bartleman helped find a temporary place for Durham to preach and sat on the platform with him. The easier way was a smashing hit. Great crowds came to hear and join him. Not long afterward, (1912) Durham died, but his easier way is still popular today. His teachings were incorporated into quite a number of existing churches, but was denounced by Sis. Crawford, Seymour, Parham, Mason, and Fisher. One of the first new churches to be started using Durham’s teaching was Aimee McPherson’s Foursquare Gospel Church. Frank Ewert came to Los Angeles about 1911, and soon became Durham’s assistant pastor, taking over when Durham died in 1912. He soon brought out the ‘Oneness’ or ‘Jesus only’ teaching. Surprisingly, Glenn Cook fell for it. He and Ewert rebaptized each other in Jesus’ name in April of 1914. It is easy to see how something like this could come from rejecting sanctification as an experience. Always trying to grow into sanctification without that full surrender God demands of us could never work. How could Glenn Cook fall for it and for not following Jesus’ instruction for baptizing? About seven years earlier, while Sis. Crawford was going to Salem and Portland, Glenn was on a similar mission to Oklahoma, Indiana, and points along the way. Now he was retracing his steps with another gospel; rebaptizing people. Did this affect us? It is a question of degrees; it most certainly had an impact upon us. We’ll get back to that later. In 1913, some of the white ministers who had been operating under the umbrella of Mason’s church got together and expressed an interest in forming their own association that would more clearly define their goals and beliefs. Howard Goss came up with the idea and proposed it to E.N. Bell who published a church paper. Bell had accepted the ‘finished work of grace’ along with Goss. Thus, the two of them were the ones who made that decision to form an association. Daniel Opperman, Mack Pinson, and Archibald Collins joined them in issuing the ‘call’ and it was directed to all the churches of God in Christ, to all Pentecostal or Apostolic Faith Assemblies. This would be primarily the white congregations who had affiliated with Mason (who was also invited and asked to advise and assist) and all the other independent, or undecided congregations who had been in Parham’s Apostolic Faith. Mason still held to the original doctrines while none of the five did so. A large group of ministers met in 1914 in response to the ‘call’. But by the time of their second meeting in 1915, the Ewert doctrine had split the five leaders. Bell and Opperman had been rebaptized in Jesus (only) name. Bell rebaptized Goss. Pinson and Collins, as well as Bell, Opperman, and Goss, had reneged on sanctification so they could grow into it, a la Durham. The original stated goal was to allow differences within each congregation, to create an association, not a denomination; each congregation could define its own specific doctrines. But the ‘Jesus Only’ doctrine had split them already. Goss and Opperman left to start a new church that ultimately became the United Pentecostal Church, a ‘Jesus only’ organization. Bell, in a compromise move, switched back to Trinitarian baptism and regained his position as leader of the organization. Those following Durham’s teaching somehow avoided a showdown with those who taught sanctification. The ‘Finished Work’ was clearly backed by the leadership, no division there, but they did not force the issue with those who still taught sanctification. The results are that some congregations still teach sanctification, although that puts them outside the mainstream. The new organization would not be a church, but an association, an assembly of God. Well, that is an impossible goal; to be an undenominational church group. Whatever you do, however you do it, it will become a denomination. So the Assemblies of God and the United Pentecostal Church became the destination of most of those who had been Apostolic Faith under Parham until late in 1906. Both follow Durham, (you don’t have to be sanctified before receiving the baptism) and one follows Ewert (disregards Christ’s instruction for water baptism). There is a notable exception that some Assembly of God preachers teach entire sanctification as a necessary prerequisite to being baptized with the Holy Ghost. So how does all this affect us? Well, all these people claim Azusa Street Mission as their roots even though they disagree with the original doctrines. (Charles Mason went to the Azusa Mission for his baptism; therefore, when those who had been a part of Parham’s Apostolic Faith Bands moved to the Church of God in Christ, they felt they had moved their roots from Parham to Azusa.) Also, some of the churches under the influence of Cook, but never Parham, retained the name Apostolic Faith or some variation of it. You can find both black and white Apostolic Faith churches that are ‘Jesus Only’, or non-Trinitarian. We distance ourselves from those who accepted these new (false) doctrines, yet we should not let that make us forget our own heritage. On the Day of Pentecost, people from many different countries were gathered at Jerusalem. There they heard Galileans praising God in their own national languages, Acts 2:5-7. Today, people who believe as they did at Azusa in 1906; who are sanctified as a second definite experience prior to being baptized with the Holy Ghost, and who speak in praise to God in understandable foreign languages are usually (but not always) called Pentecostals. People who believe as Durham taught, and who speak in tongues, but not necessarily an understandable language, are often (but not always) called Charismatic. We are Pentecostal. We are Trinitarian. Our roots are Holiness. 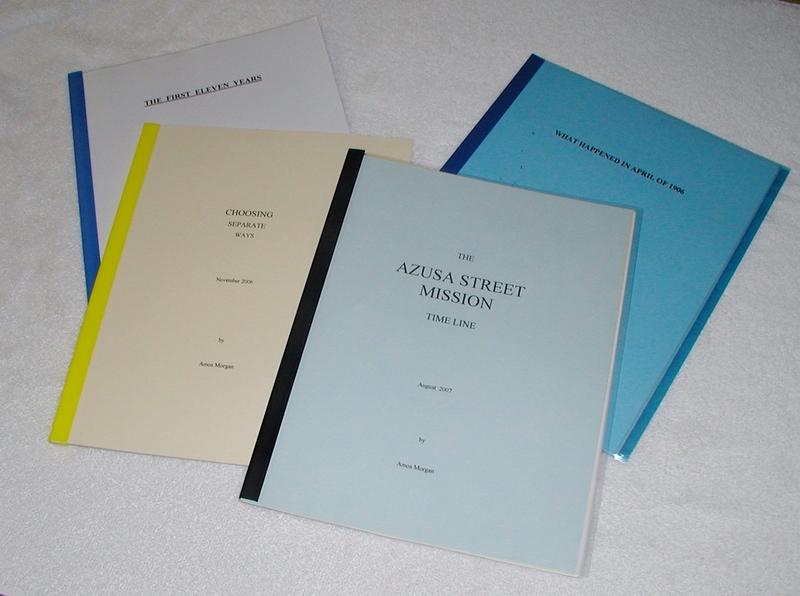 Our doctrines are the original doctrines learned at The Apostolic Faith Azusa Street Mission in 1906. The practice of letting anyone sit on the platform if they claimed the Pentecostal doctrine proved to be troublesome for Sister Crawford. Former associates wanted to use her platform to evangelize their ‘new light’. Numbers were all on the side of change. Sister Crawford felt almost overwhelmed. She was an island. Her husband Frank had waged, and won, a custody battle with her, and for about a year Mildred was taken away from her. She had no one to turn to, no leader and no peers in whom to trust. Her reaction was to determine she would die fighting rather than give up or compromise. “You can sever my right arm from my shoulder, but I will never back up or compromise the truth”, she would say. Two effects of this struggle would last for a long time. (Remember how Jacob limped for the rest of his life after he wrestled with the angel?) 1.) People who did not support her were asked to leave; no formalities, just get your hat and go. 2.) She strongly discouraged marriage. Today we can be thankful for her determination and courage. Without it, she would surely have failed. Our paper still carries the same doctrines it did in 1906, although now our young people are not discouraged from marrying and people are not asked to leave, even though they hold different doctrines, just so long as they do not try to promote those beliefs in our church. We are no longer in our infancy and everyone knows what we stand for. Bro. Ray Crawford was converted at about 17 years of age. Two years later he was ordained as a minister. This was a great help to his mother as she now had someone within her own family to lean on for help and support. Mildred had been a constant and close companion to her mother since the earliest years, but when she was about twelve, her dad took her from her mother through a custody suit, and for about a year she only had weekend visitation rights. This was about 1909 and just as Bro. Ray was answering the call to preach. He referred to his mother as ‘mother’ and soon everyone else was doing the same. She became “Mother,” or more formally, Mother Crawford. Frank Crawford was saved in Los Angeles and came to camp meeting in Portland in his later years and was an Apostolic in the end. Bro. Ray was so happy to see this happen. Sis. Crawford surely must have prayed for him many times during her life. Frank was a man of medium build, and an easy smile (after he was saved). He introduced himself by saying “It’s that old familiar name of Crawford.” It was hard for those who knew him to visualize him as being Bro. Ray’s father, as Bro. Ray was such a big, tall man. Pastor Glassco held a holiness camp meeting at 12th and Division Street in Portland in 1906. In 1907 Pastor Hanson of Dallas, Oregon joined him in a Pentecostal camp meeting at the same location. Sister Crawford arrived in Portland before that camp meeting began and stayed for a part of the camp meeting before returning home to Los Angeles. Before the 1908 Mount Tabor camp meeting, two important events occurred; Sister Crawford moved to Portland and Pastor Glassco resigned as pastor in deference to her. The Apostolic Faith paper, formerly published in Los Angeles, was published from the Apostolic Faith Camp Meeting at Mount Tabor in Portland. Assisting ministers at that camp meeting were Rev. J.G. (Jack) Robbins and Rev. L.N. Bourcey. Bro. Bourcey was a mission preacher in Portland before going to Salem to hear Sis. Crawford there in December 1906. He continued in affiliation with the congregation in Portland. Bro. Jack first came to the 1907 camp meeting at 12th and Division. 1909 through 1920 camp meetings were held each year in a large tent or temporary building. However, during these years, there was a permanent church location and the camp meetings were at various temporary locations. The ten-acre site at 52nd and Duke was purchased in 1920, and a tent erected there for that camp meeting. By the next summer, 1921, the present tabernacle had been built. Two subsequent enlargements brought it to its present size; in 1939, wings were added to each side and in 1947 the platform was moved farther back, thus extending the length of the building. In summary, we see that on January 1, 1901, Mrs. Agnes (Ozman) La Berge, with a few of her companions present, prayed that she might receive the Holy Ghost if she had not done so when she was sanctified. She and her companions had been involved in prayer and Bible studies for about ten weeks. It was just a little past midnight when their prayers were answered. After being baptized with the Holy Ghost, she began to pray in another language. Rev. Charles Parham, leader of the Bible school where this occurred in Topeka, Kansas, took the name of Apostolic Faith for the group and evangelized there and in the adjoining states for a little over three years. Going on to Texas in late 1904 or early 1905, he began having great success in the meetings. W. Carothers joined with Parham and was made Field Director. Parham took the title of Projector for himself. They started another Bible school; this time in Houston Texas in the fall of 1905. Houston was racially segregated then, but a black preacher, Rev. W. Seymour listened in on the school and embraced the teaching without personally experiencing the baptism at that time. In early 1906, Seymour was asked to come to Los Angeles as pastor of a holiness church there. When he arrived and began preaching, as he had been taught at the Apostolic Faith in Houston, Mrs. Hutchins, leader of the group, rejected him as pastor and locked him out of the church. Instead of returning to Houston, Seymour began holding cottage prayer meetings in the home of Richard and Ruth Asbery. There, on April 9, 1906, several black women were baptized with the Holy Ghost and spoke in other tongues. Later on in the week, Seymour also was baptized with the Holy Ghost, and by the following Sunday, they had moved the meetings to an old, semi-remodeled Methodist church on Azusa Street. Florence Crawford heard about the meetings and began to attend. She consulted Seymour about her spiritual condition and was told, “Sister, you have a wonderful case of salvation, but you need to be sanctified.” After being sanctified and, later, baptized with the Holy Ghost, she soon joined the ministerial staff as well as the office staff. Soon she began making evangelistic trips. It was Oakland in August and then again in November; this time going on to Salem, Oregon and then on to Portland before returning home by way of Oakland in January of 1907. 1907 was, in many ways, a year of great change. After two weeks in Portland, Sis. Florence Crawford had returned to Los Angeles to face a difficult year in her own domestic life. She returned to Portland again in the spring; and remained for most of camp meeting when she was called home for a time. She moved from her home in the Highland Park area to 149 E Ave. 53. In early 1908 Sis. Crawford moved to Portland and established that as headquarters for her work; bringing with her the paper she helped start in Los Angeles. Sis. Lum also came with her. Winds of change swept through churches. New doctrines sprang up among old friends, and pressures for change reached all the way to Portland. Sister Crawford isolated and insulated herself and stood alone to preserve the original doctrines. She prevailed. Doctrines of the Apostolic Faith, Headquarters, Portland, Oregon, are the original doctrines preached at the Azusa Street Mission when she arrived there in April of 1906. Cardinal among doctrines that have been maintained is the requirement for sanctification PRIOR to receiving the baptism of the Holy Ghost, and of the Divine Trinity. We have kept the Faith. Camp meetings have always been an important part of our church mission and outreach. They are a high point of our year, as we count the year from one camp meeting to the next. It was at great personal cost and hardship that Sister Crawford first brought the Pentecostal message of the Apostolic Faith to Portland, Oregon. It was with great personal courage and determination that she isolated the work from a more popular and easier way while the church was in its infancy. We who enjoy the ‘Old Fashioned Way’ owe her a debt of gratitude for giving herself so unselfishly in those crucial years. We still enjoy a special blessing by holding a camp meeting each year. Vinson Synan The Holiness Pentecostal Movement in the United States William B. Eerdmans Publishing Co.
Carl Brumback SUDDENLY...FROM HEAVEN Gospel Publishing House, Springfield, MO. For the pre-history of our church, 1901 through 1905, if more than one version of a story exists, the collection of stories by Richard Crayne is accepted as the authority. For the early-history, 1906 through 1908, The Apostolic Faith, a church paper published by the Azusa Street Mission, is accepted as the highest authority.